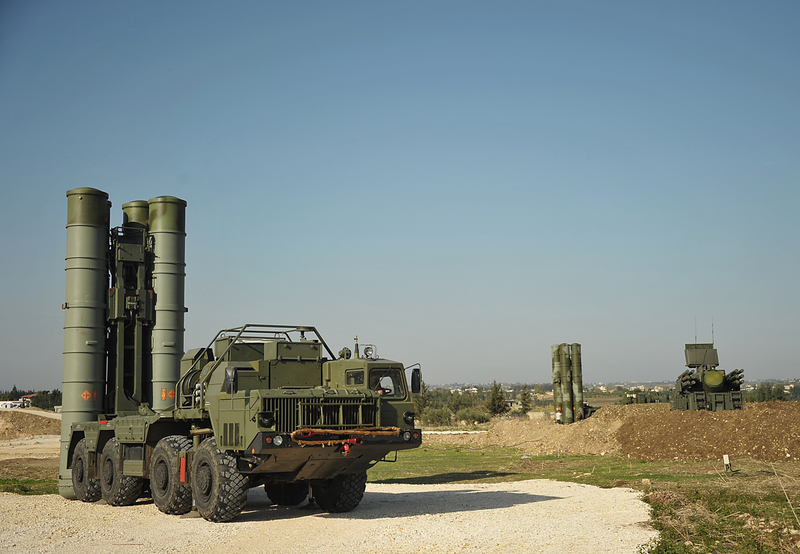 An S-400 air defence missile system is deployed for a combat duty at the Hmeymim airbase to provide security of the Russian air group's flights in Syria. The ministry believes that unsanctioned American strikes may result in the deaths of Russian officers. Russian military experts say that decisions to destroy unidentified airplanes will be made instantaneously. Russian air defense and anti-missile systems in Syria are ready to shoot down "any unidentified flying object" if air strikes are carried out on Syrian government positions, according to Russian Defense Ministry Spokesman Major General Igor Konashenkov. The motivation for Konashenkov’s statement, made on Oct. 6, was a series of leaks in foreign mass media sources about discussion by the U.S. government of the possibility of launching air strikes on Syrian army positions. Konashenkov said that most Russian officers involved in Syria work on the ground, bringing humanitarian aid to neighborhoods under the control of the current government. Russian servicemen are also playing a role in negotiations with the heads of various settlements and armed groups in most of Syria's provinces. "Any missiles and air strikes on territory controlled by the Syrian government will create a clear threat for Russian servicemen," added Konashenkov. He noted that the S-300 and the new S-400, which has a striking range of 250 miles (400 km), are both located in Syria to guarantee the safety of the Russian servicemen present in the military bases of Khmeimim and Tartus. "We have taken all the necessary measures to exclude any possible ‘mistakes’ made in relation to Russian servicemen and military facilities in Syria after the events that took place on September 17 in Deir ez-Zor," said Konashenkov, referring to the mistaken bombing of the positions of the Syrian army by the U.S. air force that resulted in the death of 62 servicemen the injury of more than 100. According to an RBTH source in the Russian defense industry, if fighters appear in the area where the Syrian government army is active, Russian radars in Syria are not able to identify them. "American planes fly with their transponders turned off [transponders help determine whose plane it is – RBTH] and also there is the agreement on the prevention of air incidents and the delimitation of zones with military activity,” said the source. “Therefore, if in places where Russian officers are present there appears a fighter or a missile is launched at this zone, the decision to save our servicemen will be made instantaneously,"
According to editor-in-chief of Russia in Global Politics magazine Fyodor Lukyanov, the Defense Ministry's statement has been made to avoid war. "This is a precise and unambiguous warning, which is supposed to play a preventive role. The Russian military is making it clear that an attack on Russian servicemen or the Syrian forces will be perceived as an act of aggression against Russia," said Lukyanov. He stressed that the professionals working at the Pentagon understand the consequences of such incidents. Last week Russia sent an additional S-300V4 Antei-2500 anti-aircraft system to Syria, which according to NATO classification is known as the SA-23 Gladiator. This is a "crawler" modification of the air defense system that works to cover units in combat positions. "It is used to cross rough terrain in a convoy of armored vehicles: tanks, armored personnel carriers and so on. Its objective is to cover ground troops from missiles and air attacks in combat zones," said Viktor Litovkin, a military expert at the TASS news agency. According to Litovkin, the system is capable of destroying enemy ballistic missiles, which can approach targets at a speed of up 2.5 km (1.5 miles) per second at a range of 150 km (93 miles). Several days earlier Russia also dispatched Su-24 and Su-34 bombers, with the Su-25 attack plane to also be sent to Syria. Additionally, two missile ships equipped with the Kalibr-NK cruise missiles will redeploy toward Syria in the Mediterranean Sea in mid-October, as well as the Admiral Kuznetsov aircraft carrier, bearing Su-33 and Mig-29K/KUB fighters and Ka-52K combat helicopters.